SARP team members prepare their rocket for launch at the 2018 Spaceport America Cup. It’s 109 degrees in the New Mexican desert at Spaceport America, where more than 110 college teams from across the globe have convened and are ready to compete. In addition to sunblock, tools and plenty of water, they have brought the high-powered rockets they’ve built over the last year. Ranging from eight to 20 feet in length, the rockets are designed to reach heights of 10,000 to 30,000 feet. The challenge — Spaceport America Cup — is an incredible, if not unusual, opportunity. Designed around the Intercollegiate Rocket Engineering Competition, the challenge hosts student-built rockets of all chemical propulsion types— solid, liquid and hybrid. To win, the teams’ rockets must launch successfully, achieve maximum altitude and be recovered after landing, hopefully in one piece. “For students interested in rocket science and aerospace engineering, it’s the best,” says aeronautics and astronautics (A&A) senior Clifford Jess Grant. He’s the chief engineer for the UW’s student-run rocketry organization, the Society for Advanced Rocket Propulsion (SARP). Grant joined SARP as soon as he stepped on campus his freshman year. “The team is one of the main reasons I decided to attend the UW,” he says. He’s eager to spend his final year leading SARP to success at next June’s Spaceport America Cup. Cat Hannahs adjusts a mill during fin manufacturing. The team fabricates rocket components in A&A’s Bossart Machine Shop and the ME Machine Shop. Team members spend the academic year designing and constructing their rocket. Here Cody Olson and Aakash Kurse prepare aluminum stock to be lathed into the payload coupler. Nearly 200 students are involved with SARP; most are A&A majors but some come from other areas, such as mechanical engineering (ME) and computer science and engineering (CSE). The team focuses a full-year’s efforts on designing and building a single rocket for competition. SARP primarily builds hybrid rockets — rockets that use a combination of solid and liquid fuel. These types tend to be safer than their solid or liquid counterparts but are more complicated to design and construct. Structures lead and A&A senior Austin Cassayre explains the rocket base airframe and fin design at last spring’s UW Engineering Discovery Days. “The team is one of the main reasons I decided to attend the UW,” says SARP chief engineer Clifford Jess Grant, right. Here he works with Structures team members Aaron Goldfogel and Elliott Leisen on the carbon fiber layup of the fin can. “There’s so much involved in building rockets,” says CSE senior and SARP’s Avionics lead Sabrina Tong. She joined the team a few years ago; SARP needed students with programming and circuitry skills, and she was excited for the opportunity to apply hers to an aerospace-related project. “In addition to technical skills such as programming, system design and analysis, we learn project management and leadership skills,” she says. At competition, each team usually launches just one rocket, so they hone their efforts into precision design and construction. Successful rockets must launch a payload — the equipment being transported by the rocket — and be recovered after flight. 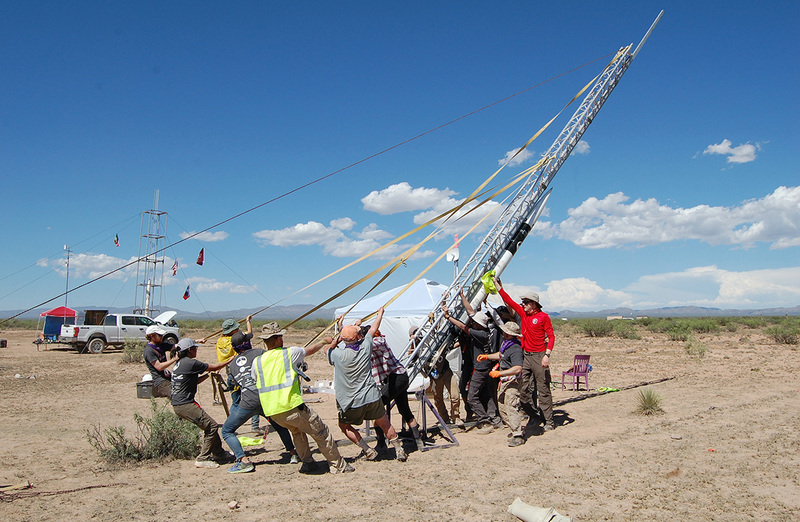 After three days of set-up at competition, the team hoists its rocket into launch position. SARP designs its rockets to reach 30,000 feet at a speed of Mach 1.3. Last year, the team’s rocket measured about 14 feet from the tip of the nose cone to the bottom of the fin can. Building a successful — and safe — rocket is no easy feat. To get the job done, the team divides into several subteams. The Avionics team focuses on remote fill and launch sequence control, in-flight data and tracking. Structures is concerned with the airframe and other structural components. The Propulsion team develops the motor. Payload designs and creates the item that will be transported inside the rocket (last year’s was an autonomous rover and this year’s is a plasma actuator). The Recovery team determines how to safely recover the rocket, and the Business team is responsible for administration, publicity and sponsorship. SARP’s rocket is single-use, and competition marks the first — and only —time it will fly, so everything has to run smoothly. “We test components, subsystems and small-scale versions on campus and at remote sites in Oregon and Washington, but usually the only time we get to see the whole rocket fly is at competition,” says Tong. “As you might imagine, we all get a little anxious on Launch Day,” Grant adds. SARP’s 2018 rocket, moments before launch. It measured about 14 feet from top to bottom and had a target altitude of 30,000 feet with a maximum speed of Mach 1.3. “Even though we’re competing, we all have similar anticipation at the moment of lift off,” says Grant. The teams spend three days in the desert preparing for launch. On day one, they set up their base camps, launch pads and guide rails. They also start assembling their rockets, installing payloads and testing subsystems. On day two, they set up remote control stations. Judges review and assess the rockets; those that pass inspection are moved to their respective launch sites. On the third day, the rockets are ignited, and teams and judges watch from a safe distance as each soars into the air. Environmental elements — rising temperatures, wind and dust — can make a launch even more challenging, and sometimes dangerous. Last June, SARP’s was one of 94 rockets that took off during the competition’s launch window. Teams are assessed on everything from written technical reports to design implementation to overall flight performance, recovery and successful payload functionality and landing. Despite the abnormal flight, SARP’s rocket met its altitude goals, and its construction and engineering impressed the judges. The team took first place in their division. Team members are now focused on refining last year’s rocket design for next June’s competition. Three, two, one…lift off! Team members watch their rocket soar into the sky. Help SARP build and launch their rocket at next summer's competition by making a gift to the team's crowdfunding campaign.